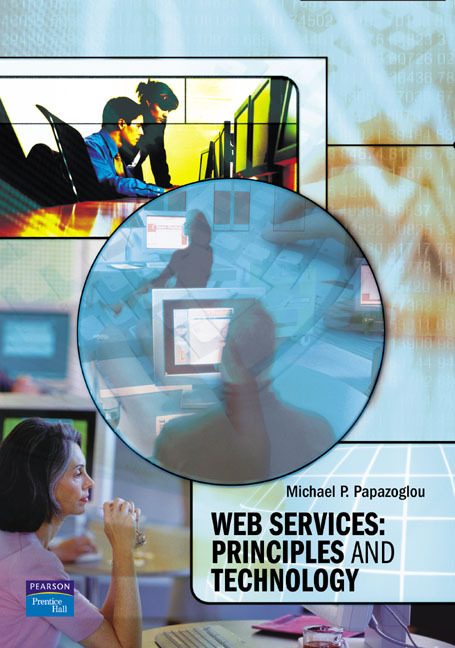 M. P. Papazolou, Web Services: Principles and Technology, Pearson Education, Great Britain, 2008. S.-Y. Hwang, E.-P. Lim, C.H. Lee, C. H. Chen, 2009, “Dynamic Web Service Selection for Reliable Web Service Composition,” IEEE Transactions on Services Computing, 1(2), NSC 96-2752-H-110-005. Lee, C. H., S.-Y. Hwang, 2009, "A Model for Web Services Data in Support of Web Service Composition and Optimization," Proc. of International Workshop on Web Services Performance (WSP 2009), associated with ICWS2009, Los Angles, USA. S.-Y. Hwang, H. Wang, J. Tang, J. Srivastava, 2007. “A Probabilistic Approach to Modeling and Estimating the QoS of Web-services-based Workflows,” Journal of Information Sciences (INS), 177(23), pp 5484-5503, SCI Expanded. S.-Y. Hwang, C. Ying, C.-H. Lee, 2009, “Selecting Web Services and Participants for Enforcing Workflow Access Control,” Proc. of Hawaii International Conference on System Sciences (HICSS-42), Big Island, Hawaii. S.-Y. Hwang, E.-P. Lim, C.-H. Lee, C.-H. Chen, 2007, “ On Composing a Reliable Composite Web Service: A Study of Dynamic Web Service Selection,” Proc. of 2007 International Conference on Web Services (ICWS2007), Salk Lake City, USA.